Heat oven to 400°F. Spray large cookie sheet with CRISCO® Original No-Stick Cooking Spray. Unroll pizza crust dough on cookie sheet; press dough into 15x10-inch rectangle. Bake 8 to 10 minutes or until light golden brown. In 10-inch skillet, cook beef, onion and chiles over medium heat 8 to 10 minutes, stirring occasionally, until beef is thoroughly cooked; drain well. Stir mustard, garlic powder, Worcestershire sauce, salsa and jelly into beef mixture. Cook over medium heat 5 to 6 minutes, stirring occasionally, until slightly thickened. 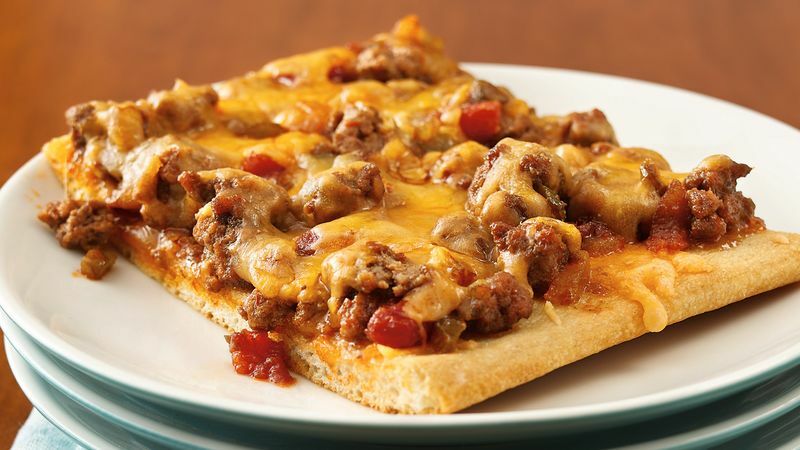 Spread beef mixture over partially baked crust. Sprinkle with cheese. Bake 8 to 16 minutes longer or until cheese is melted and crust is golden brown. Let stand 5 minutes before cutting. *If desired, remove ribs and seeds from chiles before dicing for less heat.